The current trends of trying to eat healthier, and to include more fresh fruits and vegetables into our meals, either for fitness or for better health, could be a good sign that opening a fresh, sustainable, juice bar and smoothie café could attract a viable customer base and be a feasible green business idea. While many restaurants, coffee shops, and cafés may offer fresh juices or smoothies, a juice bar that focuses on using only sustainable and organic ingredients might have an edge over other similar businesses, especially in areas with a very eco-conscious community. 1. 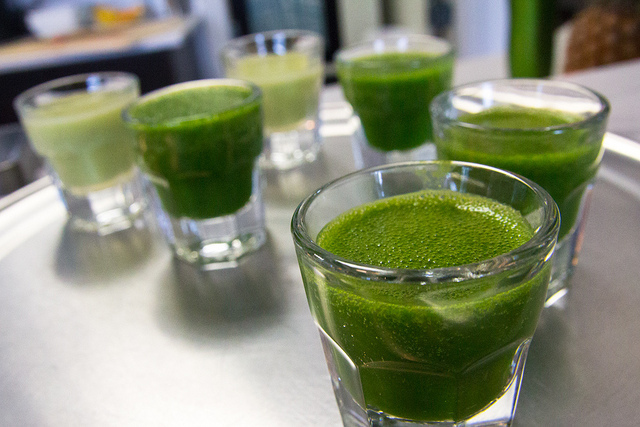 What is a sustainable juice bar and smoothie café? Sustainable juice bars and smoothie cafés sell freshly squeezed juices and blended smoothies made from organic, local, and seasonal fruits and veggies. Sustainable products like yerba matte and acai may also be included. Many people are seeking out healthier fast food options, trying to incorporate more fruits and vegetables in their diets, and have heard that juicing is a great way to capture a lot of vitamins and minerals from raw produce that might otherwise be lost during cooking. Juice bars and smoothie cafés are small-scale businesses that can be started inside a gym, in a kiosk at the local mall, or anywhere else you might be able to simply rent some space, as opposed to a stand-alone building. There are many great ways to incorporate locally sourced, organic and seasonal produce that will greatly improve the environmental footprint of the business, as well as the health of your offerings and the creation of community in your area. Food service experience is helpful but not a necessity in running a juice bar and smoothie café. There is no need for you to have an education in nutrition, as most people understand that fruits and vegetables are a healthy part of their regular diet. However, being able to calculate caloric content and some basic vitamin and mineral details to add to your menu and product labels would encourage your customers to buy. The work requires that the worker be able to be on their feet for extended periods of time, a good ‘people person’, and be able to lift up to 25 pounds. $$-$$$ (on a scale of $ to $$$$$) Other than the standard overhead costs such as rent and utilities, the largest investments in opening a sustainable juice bar will probably be the money to purchase commercial quality juicers, blenders, and mixers, along with refrigerators and freezers for cold storage. $$-$$$ (on a scale of $ to $$$$$) Offering ‘value-added’ drinks, such as those that have additional nutritional ingredients like bee pollen, spirulina, acai, chorella, or other superfoods, can help to boost the bottom line of a juice bar, and landing contracts for catering events or operating a mobile version of the business can also increase sales volume and increase the potential income. To help increase the average sale, owners could offer baked goods or lunch-type foods that fit with the theme of sustainable and organic ingredients, either made at the shop or bought from another local business. 5. What is the best location for a organic juice and smoothie bar? Urban (best), semi-urban (very good), suburbs (good), rural (poor). Do you enjoy serving people? Do you believe in the power of food to, as Hypocrites said, “Be thy medicine”?